The weird thing is how it took so long for cab companies to take heed of a very simple equation: higher gas mileage = more profit. Is there some competitive advantage to larger cabs — perhaps simply because people prefer them? — that has made gas-guzzlers like the Ford Crown Victoria the urban taxi standards for so long? Or does Ford just give them away to the cabbies? 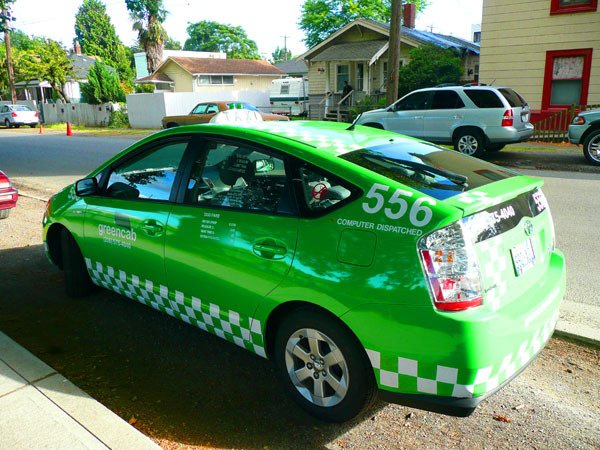 The cab shown above is owned by Green Cab Seattle, whose website claims that they offer the only all-hybrid fleet in the Puget Sound Region. This seems like a can’t-lose business concept given the environmental sensibilities of the region, not to mention rising fuel prices and the escalating imperative to cut greenhouse gas emissions. I’ve also seen Stita and Orange Prius cabs zipping around the city lately. No doubt we’ll be seeing more in the future, as the City of Seattle recently passed legislation requiring new cabs to get 30 m.p.g. by 2013. What makes hybrids such as the Prius especially well-suited for the city is regenerative braking, a system that captures energy released as the vehicle is slowed and uses it to charge batteries. Because this happens more in stop and go traffic, the amazing thing is the Prius gets higher mileage in the city than on the highway: 48 m.p.g. vs. 45 m.p.g. Busses, with all the stops they make, are also prime targets for regenerative braking. King County Metro began deploying hybrid buses with regenerative braking in 2004, and currently has 236 in operation (out of a total fleet of about 1400). Fuel savings are estimated to be 30%. Regenerative braking is yet another of the many technologies that for decades we could have been working on and perfecting and deploying, and that could really be helping to save our butts right about now. But we didn’t try that hard because our culture is just not very good at planning for anything further out than about next week. Maybe that’s just human nature, the way we’ve always been. Or perhaps, just maybe, the American experiment has begot an unprecedented human personality. Posted by dan bertolet on	Thursday, September 11th, 2008 at 10:46 pm. You can follow any responses to this entry through the RSS 2.0 feed. You can leave a response, or trackback from your own site. On buses: I know the metro site is saying the hybrids get better mileage, but vaguely remember reading that the hybrids were actually slightly *less* fuel efficient than the previous round of articulated buses had been (not massively, just something like 5.1 mpg as opposed to 5.4 mpg). If I remember correctly, the hybrids were more fuel efficient than comparable non-hybrid buses would have been, but in general buses get worse mileage than they used to because bus engines are now being optimized to reduce diesel emissions rather than to be as fuel efficient as possible. I’m sure for taxi companies it’s a cost-benefit analysis just like for anyone. Sure it will cost less once you buy the new vehicle… but when is the best time to buy? In this case, last year would have been a good choice. This really is great news. Eric De Place over at Sightline did some interesting calculations about how important improving lower Mpg cars is. Those Crown Victoria’s are certainly on the lower end. The next step is all those Police vehicles. Although that one might be a bit tougher. Perhaps now we can get away from the regressive “fuel surcharge” that taxis in Seattle are charging. My reference would be a raising of the meter rates because the surcharge unfairly punishes short taxi rides. Can we do anything to repeal this? Is this Nickels? I’ve been seeing all those surplussed taxi’s (mostly Crown Vic’s) running around here in the south end driven by teenagers, so while the taxi company’s are greening up, many of those vehicles are still on the road, now with 24″ rims and spinners. also, note on the Police vehicles, many of them are running on CNG, look for the little blue diamond on the right rear bumper. Regenerative braking works on trains, too. Suitably designed electrically powered train locomotives create braking force by generating electricity when reducing speed or when travelling downhill, thereby considerably diminishing their overall electricity consumption. Hey, how about controlling the full driving experience: Researchers showcase automated bus that uses magnets to steer. I’ve seen stories lately about how to use less gas while driving, this is the logical next step. After that, robots! First of all, as I understand it, there are two business models for taxi fleets: one where the taxi company owns the cab and leases it to the driver, who pays a daily rental plus gas. In the other model, the taxi driver owns the car, pays for gas, and rents or owns his own medallion. In both models, there are disincentives to buy a hybrid cab. A police surplus Crown Vic is much cheaper than a new Prius. Even a new Ford Fleet Crown Vic is cheaper to fix than than a Prius, since the basics of its “Panther” platform go back to 1979. So, the total cost of ownership may be lower for the Crown Vic, even with costly gas. Plus the Crown Vics have a huge trunk. It is easier to market a Prius painted green, though. According to the NYT, the hybrids’ gas savings pay for their higher purchase cost pretty quickly. That doesn’t surprise me, given the cost of gas, the number of miles per day that taxis drive, and the relative milage of the Prius and Crown Vic. joshuadf@7: I believe magnetic steering has been an expensive failure in Holland, though I don’t have any references for it right now. By contrast, I believe curb-guided buses (as used in Germany, the UK and Australia) have been in use for 20 or 30 years and have been fairly successful. Not that that really relates to hybrid taxis. Sorry for the huge testimonial, however I’m actually adoring the new Zune, and hope this, in addition to the exceptional testimonials some various other people have composed, will help you decide if it’s the right option for you….